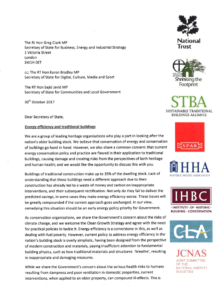 The Ancient Monuments Society (AMS), under the banner of the Joint Committee of the National Amenity Societies (JCNAS), has joined leading heritage organisations in writing to Government to raise concerns about current approaches to tackling energy efficiency in traditional buildings. The heritage sector has for many years been lobbying Government about the urgent need to revise policy and guidance on the retrofitting of older buildings, which represent up to a third of the existing dwelling stock. Research has shown that a one-size-fits-all approach can disturb the finely balanced breathability of traditionally constructed solid-wall buildings, leading to problems such as dampness and decay. Some interventions – such as external insulation – can also be damaging to their character and appearance. The AMS welcomes the research which the Sustainable Traditional Buildings Alliance (STBA), Historic Environment Scotland and Historic England have been carrying out in this area. The SPAB’s pioneering work on U-values was instrumental in raising awareness of the complications which indiscriminate retrofitting can lead to. We hope that in coming together the sector will be able to convince Government that a new approach is needed. We believe that a shift in policy will not only offer better protection to traditional buildings, it will also encourage the use of more appropriate skills and techniques, drawn from tried and tested solutions.